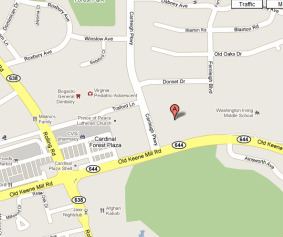 Westwood is located on Old Keene Mill Road (Rt 644 West), approximately 4 miles west of Interstate 95 in Springfield, VA.
From Washington, D.C., take I-395 south to the Capitol Beltway where it joins I-95 South. Take the first exit (Springfield), which is Rt 644 West, or Old Keene Mill Road. Proceed approximately 4 miles west. The church is located on the north (right) side of the road, just past an elementary school, next to the Cary Professional Center (small office building), and across from the Springfield Country Club. Turn into the driveway between the office building and the church. From the south, take I-95 North to exit 169A-B toward VA-644/FRANCONIA/SPRINGFIELD. Merge onto VA-644 W via EXIT 169B on the LEFT toward OLD KEENE MILL RD/SPRINGFIELD. Proceed approximately 4 miles west. The church is located on the north (right) side of the road, just past an elementary school, next to the Cary Professional Center (small office building), and across from the Springfield Country Club. Turn into the driveway between the office building and the church. The next traffic light, immediately past the church, is at the intersection of Old Keene Mill and Carrleigh Parkway. At that point, you have gone just past the church. Turn right at the light, proceed one block on Carrleigh Parkway to a point where you can make a U-turn, then come back to the light and turn left toward the church. The church will now be on your left. If you reach the intersection of Old Keene Mill and Rolling Road (a large Shell station on the right), you are two traffic lights too far and must turn around. Turn right at the light, go one block to the next light, make another right and proceed one long block to Carrleigh Parkway. 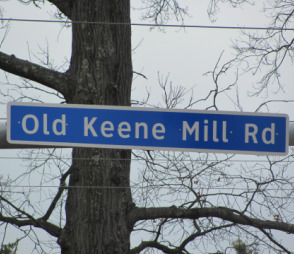 Turn right onto Carrleigh and then left at the light which is Old Keene Mill. The church will now be on your left. After successfully arriving at the church, proceed down the driveway between the church and the adjacent office building, turn left into the parking lot behind the church and park or go all the way around and up the drive on the other side of the church. The church office is in the module nearest the street on the west driveway.